Oy-vay. So perhaps, like the Bible, I would not suggest reading the Quran from front to back on your first time through. Having read through the light and gentle Introduction, the reader must next face Al-Baqarah, “The Cow.” It is the longest chapter of the Quran, with 286 ayat, and in fact also contains the longest ayah, the 282nd, which fills a whole page of the Quran. Are all these words about some cow? Certainly not! But a certain cow story (or two) within the chapter is memorable enough to warrant the moniker. …I thought it was important to take the time and look with as much sympathy as I could at its intent and meaning. Note that I will very rarely single out a specific ayah, and will try to only present content in a summarized way. This means you’ll have to read the surah yourself in order to judge whether my analysis is fair. My hope is that by doing this I’m leading you to read everything in its context, and not feeding you opinions and “proving them” with isolated selections. [Edit: in the future this idea proves unfeasible and I’ve come back and added a few coordinates to start rectifying this.] This post will cover ayat 1-93, approximately, but you should read the whole chapter when you have the time. Topics are scattered throughout the whole thing and I’ll have to jump around a lot to tie them all together. In the macro, this makes the whole chapter look effortlessly tidy, but in the micro it is still a muddle. The POV is not consistent as sometimes God is talking with the royal “We” and sometimes He is referred to in third person. I was getting really frustrated because my app only feeds me enough translation to cover one scanned-in page of the Quran at a time (averaging about seven ayat a page). As such, it was difficult to see the form. But I mostly agree with the article’s diagnosis of the thematic arrangement. As this surah is so long, and I only allocated a week to turn out each new post, I’m going to have to split it into two sections. Let’s start with just the A-D sections. Back to the A-D sections. I wanted to look at them first because as I read through them I felt a common theme of hellfire and damnation in the verses. A lot of verses are devoted to describing the disbelievers as liars, that they know the truth and refuse to act upon it. Other times disbelievers are described as blithely ignorant, and that God has actively sealed them in ignorance so that they will go to Hell. This kind of rhetoric is commonly stereotyped in religious (particularly Christian) tradition. Rhetoric such as the above Pollyanna snippet is usually built out of clippets from the Jewish prophetic literature and the Christian book of Revelation. These scriptures are harsh and fearsome, but in context they are not depictions of hell as in individualized punishment. They are about God destroying the failed religious, political, and cultural institutions (which, it is true, includes destroying those who build and maintain them) in order to start a new cycle of redemption (a la phoenix-from-the-ashes). Hell, despite its mainstream simplicity, is a vague picture in both Christianity and Judaism. Biblical explanation of how it works, what it does, and the nature of the experience is limited to being symbolized by a place called Gehenna (which was a valley outside Jerusalem where garbage–including Jewish victims of the Babylonian invasion–was burned or thrown to rot), or even just represented in some of Jesus’s parables as a state of remorseful exclusion from the Kingdom of Heaven. There is a lot of room for disagreement over whether this punishment in finite or infinite, just or unjust. I think ayah 80 might be evidence that either conditional immortality or purgatory was being considered in conversation around Muhammad, as the passage rebukes those who think that suffering for sins will be finite and no matter. In modern conversation, Muslims and Christians are, within their own groups, discussing the possibilities of a finite hell. All that above to say that I was still surprised that hellfire and damnation rhetoric feature so explicitly in this chapter, and also that God is written to play so active a part in sending people to hell without it being part of a redemptive narrative. The Bible does include God actively blinding/hardening the wills of people. A prominent example in the Bible is the story of Moses and the Pharaoh, where God keeps hardening the Pharaoh’s heart in order to keep bringing retribution upon him. This is a really harsh part of the story, but it serves so that the Isrealites will start their culture with this narrative of an all-powerful, delivering, visibly active God, and not the decision of a foreign ruler. The wrath upon Pharoah plays a role in the redemption of the Israelites into their own nation, one not indebted to any other. I’ll be interested to discern the purpose of God’s wrath in the rest of the Quran. Speaking of Hebrew lore, this surah also retells several items from it. Some items are materially the same as their Bible counterparts, others are quite altered or foreign. To a Muslim, inconsistency with the Bible does not challenge the integrity of the Quran. They believe that the Quran is directly from God’s own mind, while the Bible has been edited and assembled through an error-filled process. If two stories disagree, they would conclude it is because the Bible’s editing messed up its version. For Jews and Christians, though, the inconsistencies are more nagging and discrediting, particularly since we derive from our lore rich narratives and commentaries on God’s and humanity’s natures. There is a different creation story here. God creates the earth first, then creates the heavens (and maybe then the angels? I’m not clear when they were created). He tells the angels that he is going to make a new creature with more authority than them. The angels object, foretelling that the new creature is going to be destructive, while they themselves only give praise. God rebukes the angels by privately teaching Adam the names of things, and then asking the angels to name those things. Since the angels do not know, they are humbled and confess that God knows best. Adam then teaches the angels the names he learned from God, and the angels submit to Adam’s greater authority –all except an angel names Iblis, who I presume becomes Satan a few verses later in the more traditional garden story. I want to note that in the very middle of this story the narrative voice switches from third person to God’s POV in first-person. I do not know the significance of this, but it confused me when I saw it. 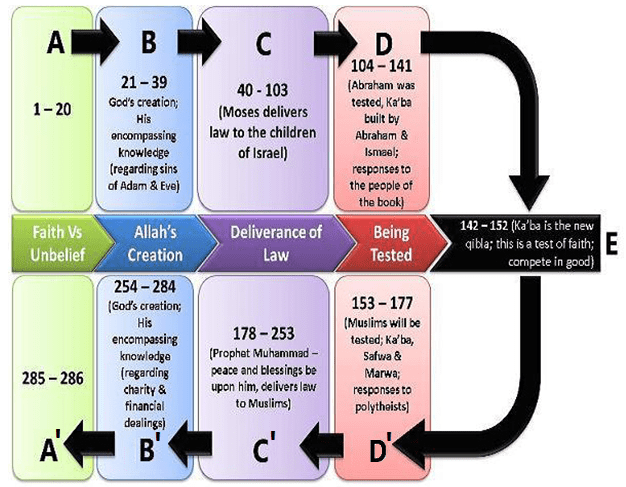 The surah then starts retelling the story of the Israelites under Moses’s guidance, labelled as Section C in the chart above. The story is one of God giving signs and the people disobeying, even when they know the truth. Honestly, the Jewish Bible covers this topic exhaustively (although usually it is those Israelites without direct experience who wander away). I think one of Judaism’s hallmarks is a deep tradition of self-criticism. The Jews study and embrace their history’s pain and failure as part of their identity. They use these stories for guidance and understand that the pitfalls and failures of Israel are representative of the failing nature of all humanity. Unfortunately for Judaism, their self-criticism has given fodder for other cultures (particularly those featuring Christianity and Islam, who feel the spurn of rejection) to condemn all Jews as particularly evil amongst humanity. This surah lingers uncomfortably in that realm, lacking almost any redemptive moments for the Israelites. And so they slaughtered it, although they almost failed to do so. I will pause to compare the sacrificial cow in this story to a similar Biblical sacrifice, but only because it includes some fun linguistic trivia. The cow described in the above dialogue is exactly a yellow version of the Torah’s red cow proscribed as a purification for those who have touched a corpse. If you read through the whole Wikipedia article, you’ll find that in the history of Judaism, only six cows were believed to have lived up to these qualifications! The Biblical choice of the color red is probably significant. Hebrew (and Arabic) words are usually expanded constructs based on three-consonant roots. The roots of the Hebrew word adom/red, are the same roots used to construct adama/dirt, dam/blood, and adam/mankind. Dirt in that region tends to be very red, and humans are linked with dirt through the creation narrative and their fate of decomposition. Now, the surah does not explicitly say what this sacrifice is for, but it is odd that the cow does not contain the old symbolic value of red. Perhaps in Arabic there is a special meaning to yellow. Or maybe pure yellow cows are less/more rare than pure red ones. Or perhaps because this sacrifice has a different function than the Hebrew one, it is a different color. Anyhow, back to the topic. The Surah does not directly link the sacrifice of the cow to the next event, but by commentaries online I’m guessing some future chapters will retell the story and link the sacrifice with the next conflict in the surah. Someone has been murdered and the Isrealites start blaming each other. God tells them to strike the slain man with part of “it”–which we presume to mean part of the cow. This brings the dead man to life again, but the Israelites grow even more resistant to God in face of the miracle. Given the sins listed of the Jews in this surah, particularly their role in corrupting their own scriptures, the Muslims are asked why they should even want such people to join their community (ayah 75). This message would have been delivered while the Muslim community was growing in Medina, where a large Jewish population existed. By all accounts, the Jewish and Islamic communities were allies in the beginning, but this alliance grew more and more strained as the Islamic community grew and Muhammad’s teachings expanded in scope and assertion. Some ayat earlier in this surah mention allies or false-believers who lie about their affiliations and beliefs, showing a distrust within the community. Eventually the Jews in Medina would start negotiating with Muhammad’s enemies, and this led to their community’s destruction. Ooph, this is exhausting. I’m going to try and wrap this up in three paragraphs, I promise. The focus from this point starts to include Christians (and both groups are categorized as People of the Book). This surah teaches that all of Muhammad’s recitations only confirm the teachings of the Hebrew Bible and the Gospel. Starting in ayah 80, the surah denounces how the Jews and Christians have handled their own teachings and teachers, and how they bicker with Muhammad over what he is teaching. Presumably there is argument that Muhammad’s teachings do not line up with Jewish and Christian ones, as the surah defends that if God supersedes or causes to be forgotten any element of prior revelation, it is because He is replacing it with something similar or better. Jews and Christians come under different condemnation than the pagans because they should already be aware of God’s revelation and able to recognize the next installment of it. Scattered sentences switch back and forth as to whether these deniers are aware of their loss or not. Perhaps the belief is that they know they are doing wrong, but miscalculate the consequences of it? They are supposedly more afraid of death than even the pagans, because they know of and fear the punishment awaiting for them. In ayah 109, Muslims are enjoined to pardon and overlook the failings of these people until God says otherwise. What are the sins of the Jews and Christians in Muhammad’s time? Perpetrating social and religious injustice, thereby acting as unscrupulously as their pagan neighbors. I’ve no doubt that these claims had plenty of fodder, injustice has sadly been a strong feature in all human societies. Christians are rebuked for calling Jesus the “Son of God.” The corrective teaching is that God can create things by just saying “be” and that as an infinite being He does not have any need or space for a son. I doubt it will be the last time this topic is covered (there is an upcoming surah called “al-Imran” which refers to Jesus’s family, and another called “Mary”). There is not enough material in this surah alone for me to understand what the argument is, except to wonder if the Quran thinks Christians believe God actually, erhem, sired Jesus, which is not the case in mainstream Christianity. I’ll wait for future chapters with more material to address this. The unrighteous behavior is a far more serious charge, as one of the promises of Christianity (put simplistically) is that believers will be cured of their corrupt hearts and no longer look to do bad things. Whenever Christians perpetrate evil, either individual or societal, they make that promise a lie. We didn’t quite get through the material of Section D this week. As it is, I believe the upcoming ayat are more tied in materially to the upcoming half of the surah. So next week I shall resume my coverage of Surah al-Baqarah with one last, interesting charge against the Christians and Jews: their mutual exclusivity.